Monday is back again. How does it creep up so quickly week after week? Friday afternoon rolls around, work ends, I blink, and it's Monday morning again. Today I packed my lunch and ate it at my desk, but still needed to get out of the office for a bit. With Macy's and Ross right across the street, I can do some major retail damage on "just a break from the office", but today I needed a few things at Long's, our local drug store. That's when this unique treat caught my eye! 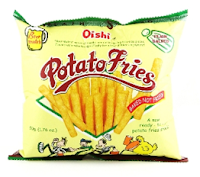 They're potato fries - ever heard of them? Not I! As the label proudly professes, they're selected specifically for a beer drinkers enjoyment. So I grabbed a six pack and went back to work... just kidding! The packaging sure is fun! Is that Big Bird chasing a detective, who's chasing a teenager, who's chasing a man in a tie wearing tennis shoes?! They're tomato ketchup flavored, which is good with me. Have you ever tried ketchup on your chips? I highly recommend it. Before we dive right into the description, let me tell you that I gave up french fries for Lent. Of course, this thought didn't cross my mind until I was ready to take a bite. My office roomie is also Catholic so I traded her a Potato Fry for her opinion on the matter. We agreed that they are not actually "french fries" since they're dried, crunchy, and sold in a bag in the drug store, they're more like chips. God won't be mad at me unless I break my promise of not eating potatoes that have been properly cut, fried in greasy fat, and highly salted. 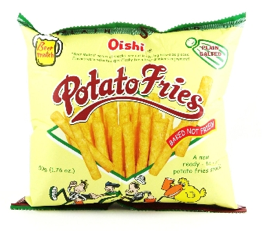 That being said, these odd little "fries" are good! They're not hollow, as I expected them to be, but solid through. They have a crinkle cut-like exterior, does that make sense? The flavoring does indeed taste like ketchup in a very good way. They're not too messy on your fingers, like Cheetos or Doritos. You Pennslyvanians and your ketchup! Heinz 57! That's right! The only thing that could make these better is if they were made with Heinz...and sold at Heinz Field! 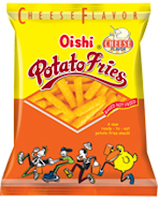 My 1st favorite Potato Fries Tomato Ketchup. 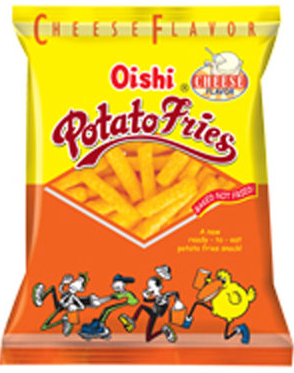 I use to eat it at my mother country , but i cannot find it in Bkk,Th. It's really good taste .